are we. What we've made of ourselves. Across this remarkable first book are encounters with animals, legendary beasts, and mythological monsters--half human and half something else. 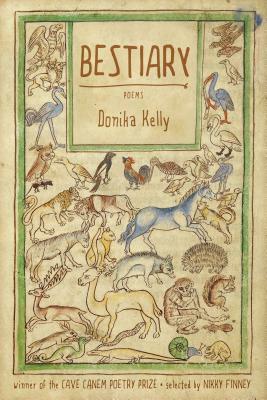 Donika Kelly's Bestiary is a catalogue of creatures--from the whale and ostrich to the pegasus and chimera to the centaur and griffin. Among them too are poems of love, self-discovery, and travel, from "Out West" to "Back East." Lurking in the middle of this powerful and multifaceted collection is a wrenching sequence that wonders just who or what is the real monster inside this life of survival and reflection. Selected and with an introduction by the National Book Award winner Nikky Finney, Bestiary questions what makes us human, what makes us whole. Donika Kelly is a poet and a scholar, and is currently a lecturer in the Gender, Sexuality, and Women's Studies Program at the University of California, Davis. Her poems have appeared in Hayden's Ferry Review, Indiana Review, and West Branch.